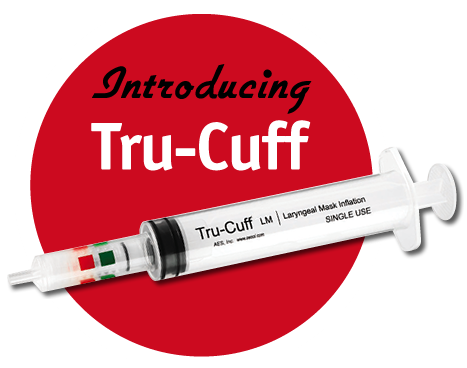 Tru-Cuff | The only inflation syringe with a cuff pressure indicator. The Tru-Cuff indicates pressure in endotracheal tube and laryngeal mask cuffs, minimizing the potential for airway trauma from over inflation of the cuff. The Tru-Cuff allows the clinician to easily inflate airways to a clinically recommended pressure with a single patient device. Easy to read color indicator bands provide you with at-a- glance feedback indicating cuff pressure, therefore improving patient safety and minimizing the risk of airway damage. The Tru-Cuff is available with the complete family of AES Ultra laryngeal masks or can be purchased as a stand-alone for laryngeal masks and endotracheal tubes.